Joe Greblo wrote: Today we received the shocking news that Greg DeWolf passed away while sitting at his computer, overlooking his garden. We're told that the coroner reported that Greg suffered from an embolism and died peacefully. Right now we're all very sad. We will be learning more soon. Many close to Greg have suggested a memorial at Dockweiler Beach, the place where Greg devoted so much time helping others fulfill their dreams, and a place where he loved to be. Greg had no living family. Bob called me with news of this tonight. This is so shocking and sad. When I started flying again at Dockweiler three years ago I met Greg and quickly counted him among my friends. He was not only a great help, and wisdom, to me getting back into flying again after 38 years but I very much enjoyed his company. At the end of the flying day I always wanted to pack up soon enough so that I always had time to sit in front of the Windsports office and chat with him before we all left for home. I always brought a beverage to share with him on the porch, when the day was done. 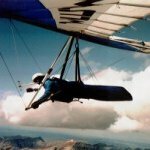 When we got the permission from the county to fly on the days Windsports was closed, I started doing that. But I felt that the downside was that I didn't get to see Greg anymore. Recently, I was considering flying on a Sunday from time to time so I could also visit with Greg. His presence at Dockweiler is going to be greatly missed and a big loss to the hang gliding community. I wonder how many people he helped "break the surly bounds of earth" in his time on earth? In the late 1980s Greg came to Ellenville, NY to give a group of us a tandem tow clinic. We were using the ATOL truck tow system at the small airport in Ellenville. I'm not sure but after ground school I think I was the first to tow up with Greg. Shortly after release at around 400 feet, a corn husk went by us - going up! Greg started circling and we gained out to about 3K AGL. He showed me how to transition to allowing the student to take over control and a few other details. He was upbeat and smiling the whole time. Then he said we should get back down to give equal time to the other clinic participants. To do so he took back control and started doing wing overs with the BIG Bennett Dream we were using. Together we weren't far from weighing 400 pounds so I was clutching Greg waiting for an LE to snap. Luckily the glider was stronger than I thought and we got down safely. A couple minutes before final glide, Greg instructed me on how to go upright with the student. Have them move to behind you and "tell them to hug you like they love you." is how he put it. He tested me (now the pilot on final) by pushing me forward during landing approach. As instructed, I calmly repeated "Remember, hug me like you love me." and he stopped his "test". We had a good landing and the other guys went on to their turns as passengers AND pilots in control. It was a great and unforgettable day - because of the great person Greg DeWolf was. Greg also liked and bought at least 3 of my PHOTO-PODs* to take with him during his Fly America event. He deserves tons of credit for that idea alone! I was also happy to see Greg at Dockweiler both in 2015 and 2016 at the Lilienthal meet. 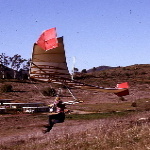 That was about 25 years after I'd seen him last and he was still teaching people to fly hang gliders! A memorial plaque should be made up and placed somewhere (Dockweiler?) that briefly describes who he was and what he did. What he did was to allow hundreds - if not thousands - of human beings to experience flight! * For those that don't know, the PHOTO-POD was a simple, light weight 35mm remote camera system I created. It was radio triggered and could take pictures from various places on your glider. Typically it would be mounted to the defined tip with the camera pointing in toward the pilot as well as the scenery beyond and below him/her. This was in the late 1980s and early 1990s. No digital cameras yet. But I could argue that the PHOTO-POD was the forerunner of the GoPro concept. Here's a photo of a gathering in the Windsports office after a day of fun and frolic flying hang gliders. Greg is either outside when this was taken or he is behind the camera. Ken Andrews, the new at the time USHPA Region 3 director, is seen sitting in the foreground. The fuzzy hair belongs to BobK and Joe Faust looks like he is going for milk and cookies. The others are students that Greg has been teaching that day. The brave among us are eating tortillas chips with some of my freshly made habanero sauce. These are a few photos from the flying after Greg's memorial yesterday. Joe Greblo was kind enough to open and close the business to allow everyone to fly in remembrance of Greg DeWolf. Thanks Joe.